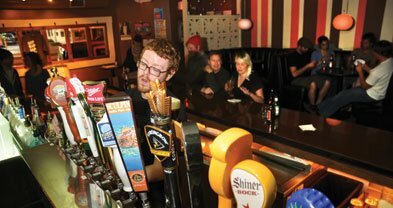 Opened in 2008 by Adam Cook and Cuong Nguyen, Soda Bar hosts local and touring musicians several nights a week. Cozy black booths and Neapolitan pink/white/brown wallpaper lend a Willy Wonka penthouse vibe to the venue, which is split down the middle by a full bar with 20 taps of primarily craft and microbrews. In January 2018, Soda Bar ownership transferred to Big Soda LLC, operated by Casbah owner Tim Mays, bar manager Angie Ollman, and musicians Cory Stier (booking agent for the venue) and Andrew Montoya. Sunday, April 21, 8:00 p.m.
Monday, April 22, 8:00 p.m.
Friday, April 26, 8:00 p.m.
Wednesday, May 1, 8:00 p.m.
Tuesday, May 7, 8:00 p.m.
Wednesday, May 8, 8:00 p.m.
Thursday, May 9, 8:00 p.m.
Friday, May 10, 8:00 p.m.
Tuesday, May 14, 8:00 p.m.
Wednesday, May 15, 8:00 p.m.
Thursday, May 16, 8:00 p.m.
Monday, May 20, 8:00 p.m.
Tuesday, May 21, 8:00 p.m.
Wednesday, May 22, 8:00 p.m.
Thursday, May 23, 8:00 p.m.
Sunday, May 26, 8:00 p.m.
Monday, May 27, 8:00 p.m.
Wednesday, May 29, 8:00 p.m.
Thursday, May 30, 8:00 p.m.
Wednesday, June 5, 8:00 p.m.
Thursday, June 6, 8:00 p.m.
Friday, June 7, 8:00 p.m.
Sunday, June 9, 8:00 p.m.
Tuesday, June 11, 8:00 p.m.
Thursday, June 13, 8:00 p.m.
Saturday, June 15, 8:00 p.m.
Sunday, June 16, 8:00 p.m.
Wednesday, June 19, 8:00 p.m.
Thursday, June 20, 8:00 p.m.
Wednesday, June 26, 8:00 p.m.
Thursday, June 27, 8:00 p.m.
Saturday, June 29, 8:00 p.m.
Monday, July 8, 8:00 p.m.
Tuesday, July 9, 8:00 p.m.
Sunday, July 14, 8:00 p.m.
Thursday, July 18, 8:00 p.m.
Tuesday, July 23, 8:00 p.m.
Friday, July 26, 8:00 p.m.
Sunday, July 28, 8:00 p.m.
Saturday, August 3, 8:00 p.m.
Sunday, August 4, 8:00 p.m.
Saturday, September 14, 8:00 p.m.